Love Child, “This is your father.” – Write with us! Yesterday, the UPS guy delivered the books, Love Child by Allegra Huston. I’ve been expecting the books, so I immediately opened the box. But instead of simply entering the product information into the computer and creating a place to display them, I was intrigued by their cover. It’s a picture of a young girl riding in a car with her hair blowing in the wind. 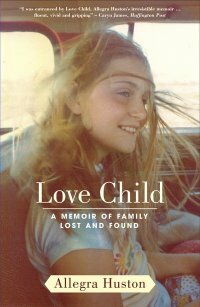 The title of the book, Love Child, is in large print right over her chest. I think what struck me the most was the smile on her face and the pure innocence that a child possesses. You never know what life will bring as you are not always responsible for the paths your life might take. But, I immediately thought of the enormous emotional impact of losing your mother at the age of 4 and learning your dad really isn’t your father. And although I could have read the back of the book which includes a summary of the life-story Ms. Huston will tell, I wanted to hear it in her voice. Listen. In case you’re wondering…the books are for my writing workshop Friday April 30th, Filling In the Blanks, led by Allegra Huston. The workshop is $55 and will begin at 9am followed by a book signing at 11am. If you are interested in attending, please REGISTER ONLINE today! Previous Post Census 2010. Go ahead…send it in! Really?